Moving seamlessly from the Almeida to the West End, Robert Icke's production of 'Hamlet' remains extraordinarily, heartbreakingly beautiful. Though it must be pretty brutal up in the nosebleeds, the Harold Pinter Theatre is basically pretty intimate, and very little has been changed or lost in the move to the 800-seater - designer Hildegard Bechtler has even made the walls look like the tiny Islington theatre's rough exposed brickwork. It's been slightly trimmed and there's a couple of cast changes, the most notable being the imminent departure of Juliet Stevenson as Hamlet's deeply, dangerously loving mother Gertrude (Derbhle Crotty takes over the role from July 4). But star Andrew Scott is here for the long haul and remains startlingly fresh in the title role, his desperately vulnerable Danish prince sobbing out the soliloquies as if he was thinking of the words for the very first time. It’s the strength of the ensemble – and the sense that these characters are a community – that makes the three-and-a-half-hours zip by, though. Jessica Brown Findlay’s Ophelia as a passionate posh girl Ophelia whose feeling for Hamlet are clearly reciprocated; Peter Wight as a startlingly potent Polonius, his rambling implied to perhaps be the first stages of dementia. It’s a production marked by constant quietly radical choices - what the hell is going on in Claudius's now deeply ambiguous confession scene? - but second time around it was the final scene that really floored me. Far from the usual brutal bloodbath, it shimmers with warmth and companionship and the heartbreaking sense that Hamlet and extended family are good friends who've misunderstood each other, not mortal enemies (in another audacious intervention from the director, Luke Thompson’s Laertes appears to try to get out of using the poisoned rapier). 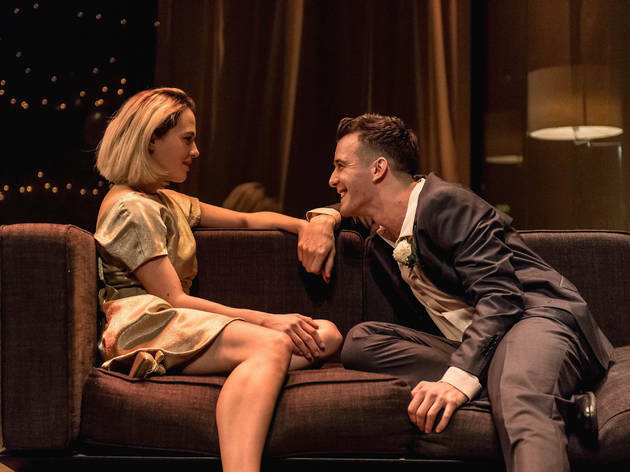 Star director Robert Icke’s achingly compassionate take on ‘Hamlet’ presents Shakespeare’s masterpiece as a shimmeringly sad vision of love. The play is always morally ambivalent, but here it’s a world free of heroes and villains, in which nobody really means badly, but everyone is damned by their passions and frailties. Admittedly most of it is one man’s passions and frailties. 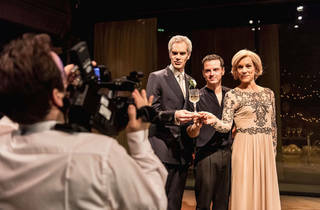 When we meet Andrew Scott’s Hamlet he is confused and miserable, blinking back tears and barely functional as he tries and fails to rationalise the recent death of his father and the rapid remarriage of his mother Gertrude (Juliet Stevenson) to his uncle Claudius (Angus Wright). But when he apparently sees his father’s ghost, who tells him he was murdered by Claudius, this withdrawn young man starts to drift in a dangerous direction. Desperate to find sense in his father’s death, he starts to tear down Elsinore. Icke is famed as an avant-garde director with a European bent, but it’s striking how little he tries to foist a big concept on ‘Hamlet’. Instead his main innovation – aside from adding a bunch of Bob Dylan songs – is to cast serious doubt on whether Wright’s Claudius did in fact commit the murder. Scholars of the text will be aware Hamlet does in fact overhear Claudius confessing to the murder, but Icke smartly – and audaciously – presents this as though it might be a hallucination of the declining Danish prince. Right to the end of this production of history’s most famous revenge thriller it remains unclear whether there is actually anything to take revenge for. And if there is, Gertrude and Claudius’s love for each other is shown to be absolutely genuine and true, and Hamlet’s poisoning of it as great a tragedy as anything else that happens. Scott speaks the verse beautifully, conversationally. It sounds like he is saying everything for the very first time, that these timeless soliloquies are his unfiltered stream of consciousness, that almost anything might happen. One moment he is calm and morose, the next he is in a genuinely frightening rage. It is livewire, edge-of-the-seat stuff. Clearly this Hamlet is not in his right mind, but as the play wears on you sense a terrible anxiety propelling his actions, a fear he isn’t right about Claudius, the tragic sense that his eloquent existential dread has nowhere legitimate to ground itself. 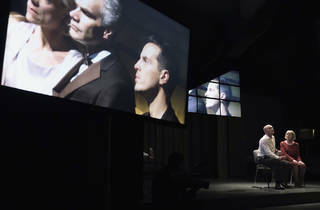 Icke’s production is stripped back and unhurried (a watch is a recurring motif); the only person in a hurry is Hamlet, desperate to do something – anything – to make sense of his dad’s death. It’s a long but uncluttered production, giving plenty of room to the words, letting the family relationships spool out gracefully. 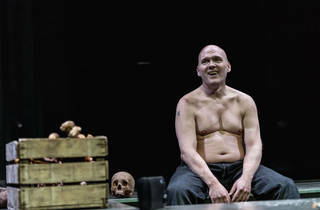 It’s also intimate and wryly comic, warmed by the rustic Dylan songs – a world away from the misguided sturm und drang of London’s last major ‘Hamlet’, the 2015 production starring Scott’s mucker Benedict Cumberbatch. The cast is strong all over: Wright’s Claudius is a brilliant study in ambiguity; Stevenson offers an increasingly harrowing vision of fierce, instinctual maternal love; Peter Wight’s Polonius is less light relief than usual, more a powerful patriarch whose powers are starting to fail him; Jessica Brown Findlay’s Ophelia is painfully gawky and innocent, collateral to Hamlet’s greater passions for his parents. The fireworks come from Scott, but he’s a long ways from his Moriarty ham mode – he is playing a bright, brilliant, sensitive young man suffering indescribably. Though Icke avoids the whizbang conceptualising of so many productions of this play, the sheer tenderness of his staging consistently and brilliantly wrongfoots us. Even the climactic fight scene is presented as warm and companionable, one last poignant glimpse of love, one last rattle of the minute hand, before silence descends. I loved this Hamlet. 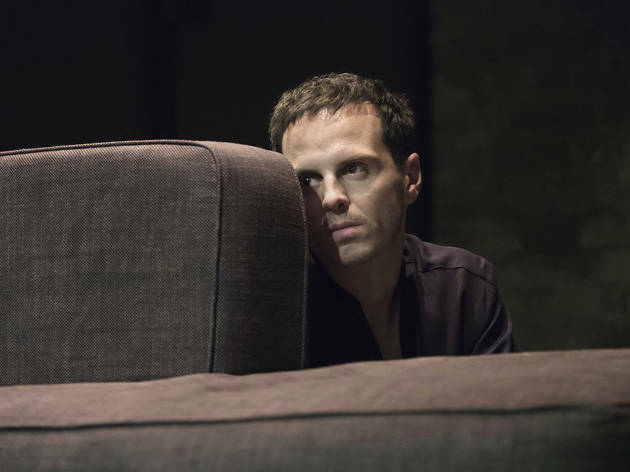 Andrew Scott has such an energy about him that every time he opens his mouth, you sit up a little straighter in your seat. He doesn't seem to hold anything back and it's amazing how he keeps this level of intensity up night after night. The production itself is so cleverly staged with the use of media, it brings the play bang into modern times. Angus Wright and Juliet Stevenson are excellent and match well with Scott's magnetism. My only criticism is the underwhelming use of Rosencrantz and Guildenstern - their absence wouldn't have detracted anything from this version of the play. Warning: We went on a relatively cool night but it got extremely warm and stuffy towards the second half. Oh, and the first intermission is about two hours in! Many people have already commented on Andrew Scott's brilliance in the role of Hamlet, but it's fair praise: he is astonishing. His performance felt so light, so vital, that it could have been of a text written yesterday. Having seen Benedict Cumberbatch, Rory Kinnear and David Tennant in the role, I am still quite comfortable in saying this is the best iteration of Hamlet I have ever seen on a stage. But this version of Hamlet isn't just the Andrew Scott show. No, the whole thing is a master-class in how to bring Shakespeare to a modern stage and make it feel relevant. Robert Icke's direction is inspired. The design, the staging, the lack of cuts to make it a shorter piece, the AV choices: everything works. The rest of the class stand up to Scott's brilliance, as well, and Juliet Stevenson's Gertrude takes Hamlet's mother in an unusually powerful direction. Her knowing death at the end was one of the striking-yet-subtle twists that made this production so incredible. Like everyone else reviewing it on TimeOut, I would urge you to get tickets if you can. Shakespeare of this calibre doesn't come around often enough, and if you miss it you will regret it. The best play I saw this year. Stunning, stark and impeccable delivery by the cast. 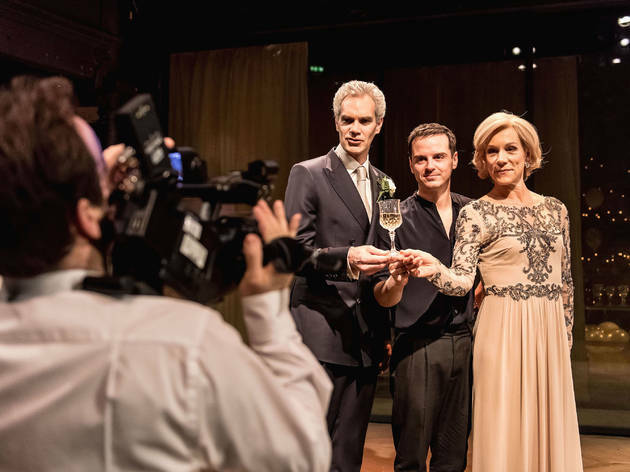 Andrew Scott's Hamlet was luminous, brilliant and empathetic. He delivers a wide range of emotions in very precise and sharp performance yet so endearing. He draws you into his loss, pain and confusion and you can see the layers and facets of emotions at each turn. Thsi is a fantastic production and I planned to catch it another time at the West End. Just to add my five stars after the fact. A landmark production with no weaknesses and immaculate casting. All the cast speak as if the words were newly minted. Scott proves himself to be the master of Shakespeare and after this run and the inevitable trove of awards, i hope we see him again soon on stage. I am hoping Ivo van Hove may come knocking. That would be a collaboration for the ages. I have seen my share of Hamlets in the last 20 years but this one stands supreme. Robert Icke has found new things to say in a production which is both thrilling and intimate. Andrew Scott is a towering Hamlet and has surely set the benchmark for years and can stand with Warner, Pryce and Beale.The audience swooned, gasped and held its breath collectively. I don't think I have ever seen a production where the audience was so transfixed. It is such a pity that this is not being filmed. While the extended run and genuine attempt to keep cheap tickets for as many as possible will allow more people to enjoy this fine production, it has been swamped in publicity by two other older productions also by "chaps on the tele". The muddled reading given in the overblown Barbican production (although Cumberbatch was superb) is on frequent rerun at theatres and the 2008 RSC version which was lucid if leaden with a totally miscast David Tennant teetering it into panto is in many school libraries. What a pity this fantastic production can't be seen as widely as those two massively inferior versions. Do anything to go see this. Theatre goers will still be talking about this production for years. Haunting. Terrifying. And still somehow funny. Never understood Hamlet, but seeing it through the eyes of grief made it all make sense. Go see. I was at what turned out to be the first preview, and was underwhelmed. It was unforgivable that Juliet Stephenson should burst out laughing at Andrew Scott's attempt to remove the dead body of Polonius. Wrong kind of corpsing. 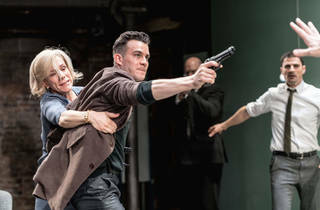 If Claudius confesses his crime to Hamlet's face and Hamlet is standing there with a gun, enraged, it makes very little sense that he would then toddle off to have a chat with his mother. There were a number of other strange choices and the pace was slow. " He was likely, had he been put on, to have proved most royally" on this evidence, I DO NOT THINK SO, Fortinbras...you obviously did not see the play. Pretty dull and lacking any real update. Having not seen this play before I had expected it to be quite hard going. But it was completely the opposite. The staging was modern - which can go either way for Shakespeare. Here the language and themes worked seamlessly with the contemporary setting. Andrew Scott was excellent and made the character of Hamlet feel very familiar. He was also incredibly funny in parts which I was not expecting. I was also not expecting the ghost sequences to be scary, but was genuinely creeped out by them. The negative for me was the sound quality. Music playing in-between scenes was incredibly loud, but there were huge stretches where I could barely hear the actors. I also heard lots of people complaining about this in the toilets. As a first timer watching the play I feel like I missed out on some key bits of dialogue and as a result I had to frantically google it afterwards. It was a shame but the genius of Shakespeare shone through (as always). When done well I always think Shakespeare plays feel like they were written yesterday, this production lived up to this test! This ‘updated’ version (it seems to happen in present time, with the setting for a contemporary house, video surveillance and a few media-clips of the ‘Danish Royal family’) still holds true all the intensity, ambiguities and suffering of Shakespeare’s play. More than three hours with two little intervals would seem maybe too much, weren’t for the magnetic production. Andrew Scott is the most vulnerable Hamlet I’ve seen, and the text becomes almost natural (as in, not play-like). The family(ies) relationships are shown with such intimacy, such love, that you can’t help share the pain all the despair is causing. Beautiful, beautiful production. I had mixed feelings when I first booked my tickets for Shakespeare’s longest play. On the one hand I’d read many fabulous reviews, on the other did I really want to sit through three long hours of this famous tragedy? In the end, it didn’t feel like a tragedy at all! Andrew Scott truly was the star of the show, with his witty - at times laugh-out-loud - portrayal of Hamlet keeping the audience captivated throughout. Unlike previous Shakespeare plays where I haven’t always found the dialogue easy to follow, the combination of the modern setting and the cast’s careful pace and expressive performances made this an absolute pleasure to watch. I highly recommend going to see this fantastic interpretation! I love this interpretation of Hamlet. I've seen it twice this summer and I want to see what Robert Icke and his outstanding troupe will do on the third go. (They're very playful, and you will never get the same thing, twice.) If you've lived at all, this version of the play will speak to you. It's all here: love, trust, betrayal, heartache, forgiveness. A must see. Thank you, thank you to everyone who has contributed to this really outstanding production. You've touched a lot of people. Hamlet is a play that has been done so many times in London over the last few years, it seems to be the role that every major star wants to do, to prove their worth. Well, this version, directed by Robert Icke and starring Andrew Scott is without doubt the best of them. The direction is wonderful, it makes the play feel current and relevant to today. I love the use of technology, the ramparts on video cameras, the war coverage on a 24hour news station, paparazzi at the wedding. Andrew Scott is a fantastic Hamlet, hurt, sarcastic and sardonic, he speaks every line as though it hurts to express his feelings. I liked the echo in the accents between he and his mother, played by Derbhle Crotty, it emphasised her love for him and his disappointment at what he sees as her betrayal. Wonderful too, to make Claudius, a modern politician king, bland and reasonable while plotting death. This is a fantastic production, it has a month left to play, if you miss it you will have missed a classic of London theatre. The standing ovation that this play received at the close is probably the most deserved ovation I have ever partaken in. Scott's performance is spellbinding - Hamlet is a play I happen to know quite well due to a year of studying it at school, so I know the themes, I know the interpretations that can be made of certain behaviours and I have seen enough performances to understand how the "madness" of Hamlet can be portrayed, and this was the most exquisite portrayal I have seen yet. 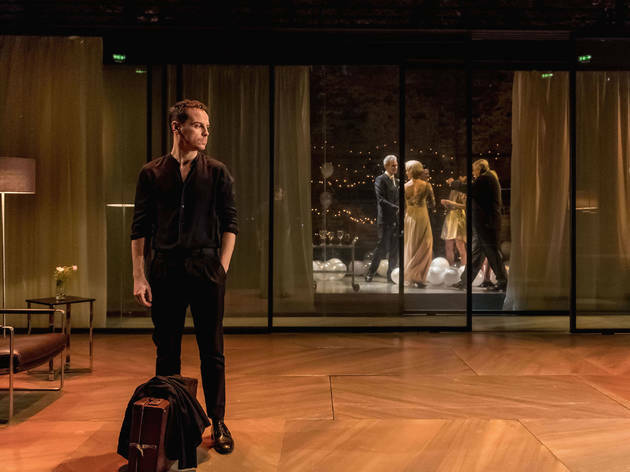 Andrew Scott's Hamlet is troubled in a way that is compelling and believable. There certainly is method in the way he portrays the madness of the character - it is painful in parts, you believe the torment and the distress of his situation, you empathise with his procrastination and you believe in the love and devastation he has for his father's fate. Some of the delivery provides for comic relief from the intensity - in fact, there are a fair few laughs in places I had never noticed before, which is a testament to the way the play has been directed and performed. Polonius is quite the likable character and you feel pity for him when he meets his end, something I haven't felt in previous productions. I did find Hamlet's uncle was ever so slightly lacking though I can't quite put my finger on why - I just didn't feel the contempt that the character deserves. I enjoyed the portrayal of Hamlet & Ophelia's relationship. It seemed real and genuine, a little innocent and both characters seemed excited by the other, like young, innocent love. Even Hamlet's "get thee to a nunnery" speech came across as caring rather than snide (as I had always interpreted the text to suggest it be) and made for an even more heartbreaking performance. Ophelia as a well spoken, mildly confident character worked really nicely and made for her deterioration into madness and sorrow more of a shock, highlighting the sorrow of bereavement. The set design is smart, with the use of glass which changes from opaque to transparent. I also liked the use of television screens, including the camera work on stage which allowed for smart close-ups on emotion, especially during "the play". With a casual 3 hour 45 minute running time including 2 intervals, this isn't the kind of play to sit through if the theatre isn't really your thing. I did find the audience to be disappointing, with many I'm sure only opting to go to see the play because of the lead role, which was highlighted by the man next to us who brought a Chinese takeaway in to eat during the second act and his companion who took photos on his phone throughout. Not to mention the person who allowed their phone to ring for a whole 15 seconds at the pivotal moment at the end of the play. Perhaps the rules need to be stipulated clearer by the theatre to avoid it ruining the experience for others, but luckily the performance was so outstanding it barely left a mark on my experience. This was the first time I watched on stage one of Shakespeare's most famous tragedies, Hamlet. I must say I came well prepared regarding the plot but still, the duration - 3 hours and 45 minutes - was too much on a weekday night. I admit I booked the tickets mainly because of Andrew Scott, who was brilliant, but so were most of the cast, if not everyone. Andrew was beautiful as Hamlet, full of energy and also heartbreaking. I particularly liked the freshness of Ophelia but also her singing. They managed to even introduce some comic moments to this tragic story. The story might have been written in the 1600s but this was very well set in modern times. The sets were exquisite. Very delicate, full of taste and of very high standards. I definitely recommend this play but be prepared for a long night. Affordable tickets are available but the view is quite restricted. A fantastic adaptation (from every aspect) of Hamlet brought to the West End that is worth every minute and every penny. Having seen this fantastic adaptation, I am lost for words with the boundless levels of skill that Andrew Scott portrayed as Hamlet. The sincerity and emotion instilled in the performance by not only Andrew, but the other members of the cast make it a show you must not miss! Andrew Scotts performance in Hamlet at the Almeida was absolutely flawless, and I don't think the show would be what it is without him. His delivery was personal, relatable, beautiful and heartbreaking. Usually when I think of Hamlet (Having studied it in College and University and also seeing so many productions and film adaptations) I think of a whiney teenager who can't make up his mind, does he have the guts to revenge his fathers death, does he loves Ophelia or not etc. But Scott completely refreshed the character for me, he made him heartbreakingly wounded, confused, helpless. He talked with the audience instead of just taking at them with incredible comedic timing. The production was also very impressive, the modern take with the Bob Dylan soundtrack and screen monitors perfected the tone of the play for me. The beauty and power of this impeccable production remain undiminished. Just as powerful as at the Almeida. It is hard to believe this production can be bettered. I have seen so many Hamlets over the last decade or so - celebrity ones from Cumberbatch, Law and Tennant which sadly failed to make any lasting impression, intense and subtle ones from theatre greats like Wishaw and Kinnear and brilliantly inventive ones like Paapa Essiedou's RSC but Scott truly towers above them all. I have seen this three times now and will do the fourth when Juliet Stevenson leaves. What a pity this was not filmed. Even if you think you are tired of Hamlet, you MUST see this version. It is the rare production where every word and nuance is felt and understood and relayed back to the audience. A Hamlet for the ages! Wow! I completely agree with Mangolisa below. The best play I've seen in a long while. Icke's clever adaptation is not over-the-top and hits just the right tone between modernity and traditional bardophile. Scott was emotional, physical and at times witty. We were blown away by his empathy and relationship with the audience. Do it, before it's too late. Well, I finally caught up with Hamlet on his last day in Almeida. And let me start at the end. I heard sobbing when Hamlet died. Maybe it was the flowers on stage and someone's hay fever, but on the whole, I doubt it. I hoped it will be good enough to stay on for the almost 4 hours as I've checked the online reviews and read about the walk outs but seriously? I think it was near perfect. What sweet prince did Andrew cut. He wasn't mad, just sad, confused and lost as anyone would be in his shoes. Yeah, maybe all the deaths were a bit too much, but you know, it's almost a reminder that this is Shakespeare. The speech flew so well I often forgot I'm not watching some Danish contemporary drama. The only one who didn't quite sit with me was Laertes, not sure why. I liked the players, Polonius, king and queen, Ophelia. Rosencrantz and Guildenstern were rather poor hangabouts, but the fact that few days ago I've seen Stoppard's play at Old Vic might be a factor here, maybe I just wanted them to be funnier? I also rewatched Stoppard's film version of the play and Iain Glen, hot damn. But I'm getting too far off course. I wonder if Shakespeare knew what he did. Probably not. He adjusted a known tale and it took flight and shows no sign of stopping. It's what all the best art does. 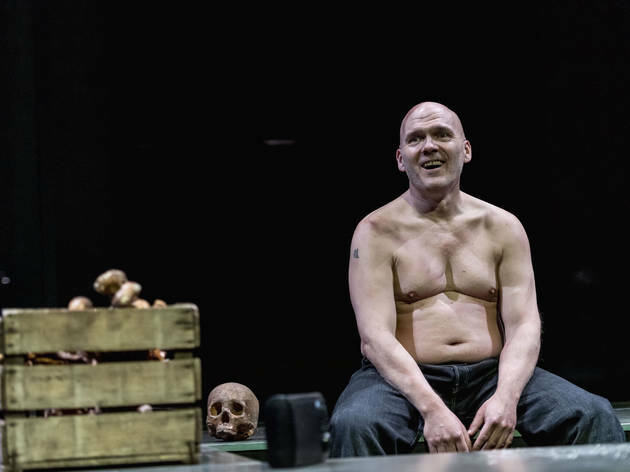 A stunning, dark, modern take on Shakespeare's Hamlet at the Almeida Theatre. It's visually intense and mind-boggling to see Hamlet being shown in such a contemporary, spellbinding way. It's almost quite distressing and also fascinating to see this show being represented in this way and manner. The style of dressing and manners of poise is changed, but the language of Shakespeare is there and is extremely prominent. It's quite extraordinary to see each and every character speak in such a natural tone. It almost feels like it's happening right now. I'm not surprised at all why this show would transfer to the West End. I believe this will be a show to remember by many individuals out there. It will commence in the West End by June until September at the Harold Pinter Theatre. It was a complete shock and surprise that my partner managed to get free tickets for the under 25s to see Hamlet. It was totally sold out and it seemed impossible, but we got the chance to see it free. What an experience indeed. It was truly a breath of fresh air, a beautiful yet mysterious take on such an historical story like Hamlet. To bring it to life in this way with such a modernity sense to it, is quite engaging to the audience. It was both captivating and alluring, miraculous yet visually outstanding. It was at times very suspenseful, but always intriguing. You could almost feel the tension and the emotion of each and every character on stage. Just incredible to see how a small space like Almeida Theatre can deliver a tremendously memorable show like Hamlet. Andrew Scott as 'Hamlet' gives his all throughout the whole show. His ability to speak with the right tone and then all of sudden switch to deliver a unique, exceptional performance. I could tell by looking at his eyes and the way he spoke on stage that he felt every word, every meaning of each scene. Its almost impossible to feel his presence on stage. Scott's acting of Hamlet is powerful and strong. I feel that it drains the energy out of you just experiencing his heartbreak. That's how incredible he was. The scenery was also a magnificent addition to the production of the show. It made it very present to this day, with all the screens, the use of video recordings and the headlines. It's worth experiencing and sharing the whimsical direction of Robert Icke who has created such a diverse, prodigious Hamlet. Jessica Brown Findlay who plays 'Ophelia' stood out for me for her essence of acting on stage. She started quite discrete, but then throughout the show she gave an almighty Ophelia who was lost, but assertive in her decisions. She displayed sheer quality to her acting and I enjoyed it very much. Juliet Stevenson as 'Gertrude' also played remarkably well and very bold in her presence. I also must mention Peter Wight as 'Polonius'. He was drastically and dramatically humorous. His silly disposition was an attribute to the show. It can be overwhelming to sit down and see a show like Hamlet for 3 hours and so on, but it's definitely worth while seeing an uncanny show like this. Grab yourselves a ticket while you can at the West End, I'm sure it will be a success. Unwind and feel the intensity and the darkness of this modernised Hamlet. Excellent production and full star rating on all points. Andrew Scott as Hamlet is just amazing. 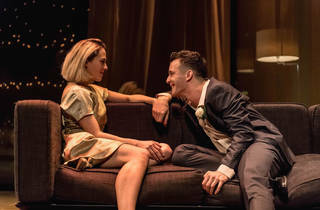 Robert Icke has managed to direct Hamlet in such a unique way that even if you cannot stand classic plays like this, you cannot deny that the direction and the fresh look on Hamlet is unique. 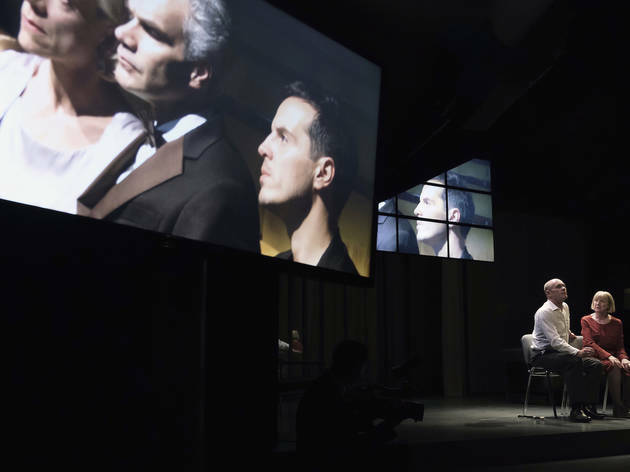 Dark, modern, intense, clever use of Almeida's limited space and extensive use of videos, live recording and technology. Superb! Since I am on this site thought I should add my own five stars here. One of the few productions where the immediate standing ovation and cheering and stamping feet was totally justified. It is a production which deserves to be revisited frequently as the richness of the line reading and direction are unparalleled. It's a production which I think will stand as a landmark and confirms Andrew Scott as one of our (Ireland's) truly great theatrical actors. Unmissable. Bravo for this superb production and Andrew Scott's raw and heartfelt performance and bravo for his stated intention to make this production affordable so as many young people as possible can experience the wonder of live theatre. I had the pleasure of attending recently with a largish college group who sat rapt throughout. Their behaviour was impeccable and they chatted enthusiastically for days about the play, the acting and the staging. Compare this to the obnoxious behaviour of a group of women nearby at Don Juan in Soho who screeched, brayed loudly and inappropriately at every line uttered by David Tennant, chatted loudly and who attempted to take pictures on their phones during the play. Thanks to the Almeida for an excellent theatrical experience which has ignited the passion of our students. Many are very keen to return to see this again when it transfers into central London. A wonderfully fresh interpretation with vivifying direction from Robert Icke which includes a seldom seen scene with Gertrude which added new light on the final act. Probably my favourite ever ending in this production. Just add to the chorus about Scott's interpretation which sets a standard unlikely to be matched for years. Stevenson is equally compelling as Gertrude. I prefer my Hamlets introspective, moody and immersive, rather than declamatory and athletic. Great news that this superb production has been transferred to the West End. I will certainly be returning again to this. Scott will be rightly winning every award going for this. If you missed out on tickets before, rush to see the transfer at the Harold Pinter theatre. This is a landmark production. The finest production of Hamlet London has seen for years. Flawless. Scott may be the best actor of his generation. Andrew Scott as Hamlet speaks his lines with great clarity. He brings intelligence, freshness & illumination to every line. A fine cast is directed with energy & originality by Robert Icke. I have long admired the Almeida Theatre, & I think this is one of their finest productions. Brilliant production. I don't understand those who have been saying it's too long. So many plays these days are fewer than two hours without intermission and the majority of them are as slight in content as they are in running time. I long for a well-acted, meaty, thoughtful production, and with this Hamlet, we have it. 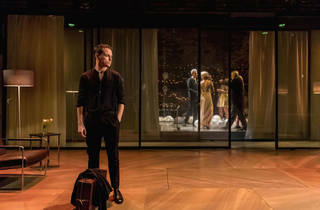 Robert Icke's production of Hamlet is an interesting update to the old bards writing, set in modern Denmark but of course keeping all the original Shakespearean script, the added use of technology and music invokes emotion and helps to bring forward the meaning behind the words. Not everyone can understand Shakespearean but that does not mean that everyone can't enjoy it, Icke's version makes it accessible to a wider audience who would usually be put off by actors prancing around the stage delivering lines they cannot comprehend, the actors in this production speak with purpose which keeps the audience enthralled by what is unfolding in front of them. 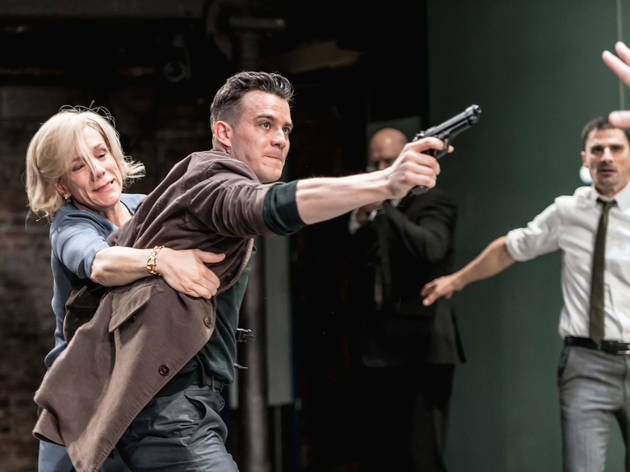 Led by Andrew Scott as Hamlet, his captivating performance oozes energy and emotion like his body can't contain the rage and need for revenge, with the addition of wit making you empathise with his character and later on emphasise his decent into madness. With incredibly strong cast including Jessica Brown Findlay as the beautiful and haunted Ophelia, this is a must see for Shakespeare fans and newer audiences or others who have had bad experiences trying to get to grips with the Shakespearean, this will change your mind.